When HIMSS announced its acquisition of Chicago-based Healthbox this past March, it had a clear vision of how the innovation consulting firm could help advance its mission of transforming health through information and technology. "Healthcare organizations look at us asking if we can help them think through concepts around digital health or how to bring innovation into their systems," said HIMSS CEO Hal Wolf at the time. With expertise in strategic investing and familiarity with more 3,000 startups and early stage technology companies, Healthbox is able to help healthcare organizations chart an innovation strategy and decide whether to build, buy or partner for their digital technology needs. But innovation doesn't just depend on technology, said Neil Patel, executive vice president of HIMSS Healthbox. New ways of thinking, new processes and workflows are all important components of a hospital's innovation plan. The key is to ensuring they gain the necessary traction across a given health system to really matter. "It doesn't have to be technology," said Patel. "It can be anything you do – anything that's novel. The key is that it's used. Just because it's something new doesn't mean it's innovative. It has to actually be in use for us to believe it's actually a true innovation. Otherwise it's just a bright shiny object." Healthcare organizations tend to call on Healthbox when they're "trying to grasp something they don't understand," he said. Sometimes it's the chief strategy officer who makes the call, or the the chief information officer. Sometimes the CFO if the questions are around strategic investing. One of the first points Patel tries to emphasize is that "innovation is a commitment – a multi-year commitment," he said. "It's something that doesn't pay off immediately, and it needs to be invested in to really work." Essentially, the consultants are looking to do a gap assessment for the health organization's innovation competency, he said, and then help them define goals that are tied in with their overall corporate strategy to make sure we're aligning with KPIs that are broadly important to them as a business." The topics that might be explored may vary widely, depending on those needs: Organizational culture. The question of whether buy, build or partner. Recruitment and retention. New product development. Revenue diversification. Market-share capture. "All those different things lend themselves to different innovation strategies," said Patel. "Then we lay out a strategy for any of those that are important, and how to prioritize those." Partnering with startups – right for you? One of Healthbox's specialties is helping health organizations form strategic partnerships with tech startups. "In order to do it well, you need to have the right infrastructure in place – and also the right culture, to be able to work with organizations that are earlier stage than the types of healthcare companies providers generally work with," said Patel. "There are benefits to working with early stage companies," he explained. "They're more nimble, they often have better products, they're often more responsive. But then there's also the downsides – some of them may not succeed. They may require more handholding, they may not have the expertise required to work with health systems." The financial arrangements are often different, too. "It's not just an off-the-shelf price with a negotiation," he said. "It's a unique set of requirements that go beyond whether the product is going to solve your problem. If you're going to work with organizations like that, going in with eyes wide open and understanding why you're doing it is very important." If it's decided that a startup partnership makes sense, Healthbox will help its clients pick the right ones. "We get very specific," said Patel, who noted that Healthbox has a database full of companies and sometimes, depending on the hospital goals, it will put out a call for proposals. Healthbox then filters down the list – "we have a scoring process, though a software solution we built, that gets down to three to five companies" – and will bring them in for presentations. Once one is chosen, it will help negotiate a contract and plan scaled implementation, he said, "not as a middleman, but as an advisor that speaks both languages." 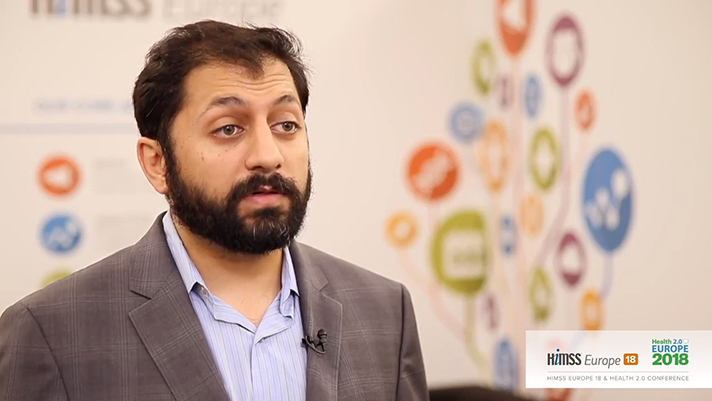 In the six-plus months since Healthbox was acquired by HIMSS, the "integration has gone really well," said Patel. "There are so many interesting assets to HIMSS – the reach, the network, the expertise – and we wanted to be able to tap into it." "We take the research and guidance and ideas that come out of HIMSS – whether it's the global conference, the educational opportunities, events, media – we could take those, not just the last mile, but the next few miles," explained Justin Gernot, vice president of HIMSS Healthbox (who will be speaking on a HIMSS innovation-focused webinar on Sept. 28). "People might get a good idea of what they want to do when the come to global conference or read an article, but they're not sure how to do that. Our consulting team can in many cases do that ourselves, in concert with other HIMSS subject matter experts. We're able to actualize what clients, broadly speaking across the healthcare industry either know they need to do or have been educated and made aware of through HIMSS."